One day, several decades ago, I sat down with a book by Captain Joshua Slocum. It was titled “Sailing Alone Around the World”. Capt. Slocum published the book in 1900–it was a bestseller–and it made him a Superstar of the Seas. His boat was named Spray. Nearly ten years later, Slocum disappeared aboard the Spray. He was never seen in this world again. I feel assured as I can that Joshua Slocum is sailing his way through the dark reaches of space and time, aboard his little boat, the Spray. I finished the book in just a day or two and since then I’ve been fascinated by the sea and solo sailing. Later I read an account of a man who was attempting a solo crossing of the Atlantic. This was back in the days when such trips carried risks that made each voyage an item in the headlines of the world’s newspapers. When I got to the end of his story and thus the end of his trip, the last pages described something he did that transfixed me with amazement. He had departed from some former whaling port in New England, Gloucester maybe. I can’t even remember the name of his boat. But, I seem to remember that after he made a final navigational fix on his position–about a day from the west coast of Ireland, he did something that I totally understood. While his wife and the press corps were waiting for him in Cork or Galway or wherever he was to dock–he took a long hard look around his world, the world that had been his home for several weeks. He saw water, he saw the sky and he saw his boat. And, he saw himself as a tiny speck in this vastness of the North Atlantic. I would imagine he began to weep. I truly believe he wept because he had become such a part of the elements of the sky and water that he couldn’t bear to lose it. He supposedly took his sail down, and delayed his arrival by one day. One more day when his whole world–his whole existence–could still be his alone. As I write this, I cannot remember his name, any book he may have written or any record he may have set. I sometimes wonder if I had made the whole story up in my own dreams. I can’t provide any evidence this really actually happened. I’ve aways wanted to make a solo crossing of the Atlantic. Several problems stood in my way, however. The first and most important issue was the fact that I simply have no idea how to sail–anything. I put a sheet up on a canoe on the Susquehanna River once when I was a kid, but that was all the sailing I had ever done. So, I went out and bought a book on how to sail. I never finished it because I had no real access to a really large body of water not to mention a sailboat. I lived in New York City where one can take lessons down at a sailing school near Battery Park. I never did. Now, I live about forty-five minutes from Lake Champlain. 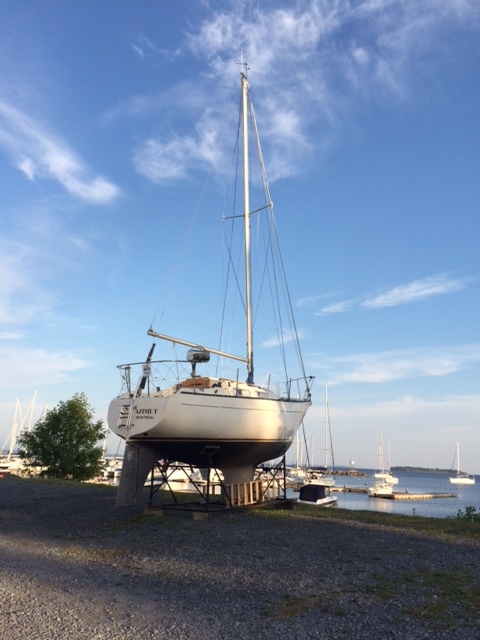 There are sailing schools in Burlington and probably Plattsburgh. I always find something else to do. Maybe I’m afraid of facing those elements that seem to draw so many men and women to the sea. In truth, I don’t even like to swim. The water is always too cold in the Adirondack lakes. I can’t imagine the chill of the Labrador Current. But, I’m a very restless soul. Perhaps I have a bit of Romany (Gypsy) blood in my veins? Perhaps, from my bedroom near the railroad in Owego, New York, I heard too many train whistles blowing and heard too many clickety-clacks of the steel wheels on the rail joints when I was a child. So, I’ve learned to put my sailing solo dream on that dreaded shelf alongside all the other dreams I have grown to accept will never be fulfilled. I lost the golden ball that I was born with. I will never climb the Matterhorn, stand in the hard frozen air of Antarctica, hike the Pacific Crest Trail–or sleep with the Prom Queen. I’ll not be given the Nobel Prize for Literature. I will never speak at the 92nd St. Y in Manhattan. Deep inside, I believe that I can rediscover that golden ball that made my childhood so full of magic. The little ball exists somewhere–maybe inside me or out there alongside the less-driven roads. I will drive the highways of Virginia and watch the Kudzu creep up the trees and engulf them. I will pass plantations in the Deep South, pass over the brown water of the Mississippi River and I will squint into the late afternoon sun in West Texas. But I know that somewhere, sometime, the Dark Irish in me will rise and I will begin to see shadowy clouds building on the horizon. 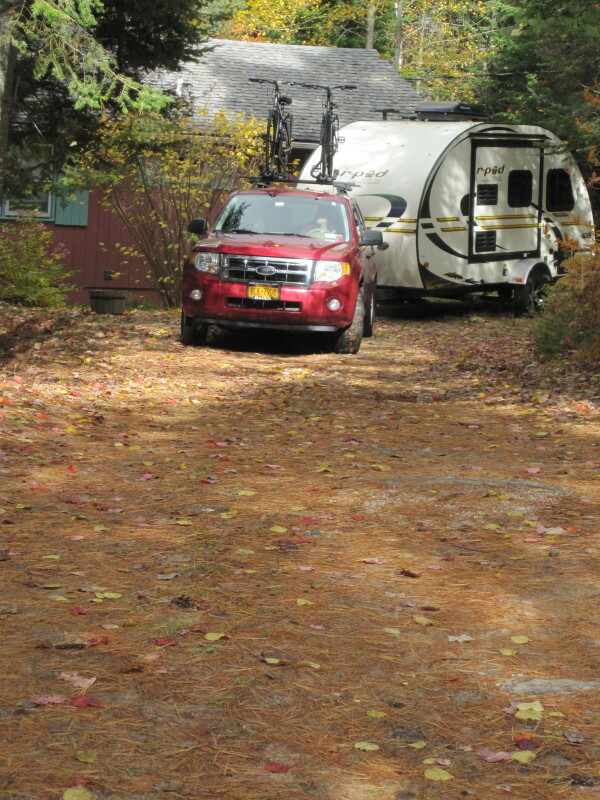 I’m channeling my wanderlust right now by pulling a small RV behind our Ford and heading to Florida for two months. Our sextant is a GPS we call “Moxie”. Our Gulf Stream will be I-95 (some of the way). I will not be returning to the cold and ice until the Springtime arrives at Rainbow Lake, New York–sometime in April. My boat is an r-Pod. My alone-ness is replaced by my wife, Mariam, whose company is delightful and engaging. I won’t be talking to the sea or the stars–hearing nothing but wind, waves and my own voice. Oh, I will park our r-Pod in the desert sometime in February and stare at the countless galaxies–count the shooting stars–and listen to a coyote or a song on the wind sung by the wandering ghost of a long-dead cowboy. But I won’t be alone. I once romanticized that kind of isolation and I still seek it, to a point. But, in truth, there’s something about the vacuum of loneliness that frightens me very much. I’m afraid of the dark–but that’s for another blog. This entry was posted in Blogging, Childhood, Creativity, Dreams, History, Holding onto the Past, Home, Love, Melancholy Thoughts, Memories, Nature, non-fiction, North Country Life, Objects of Beauty, Real Personal History, seniors, The RV Life, The sea, Time, Travels and tagged Adirondacks, fear, Florida, loneliness, the sea. many ways to find what slocum found without water – nice “beginning” photo!